Group Classes: $10 per 30 min class, $15 per 45 min. class, $20 per hour class & $30 per one and one half hour class. 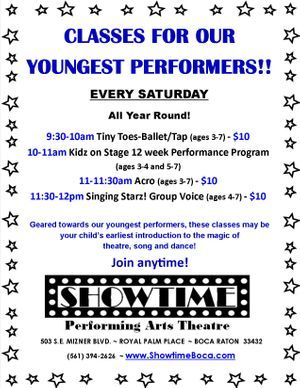 Private Voice, Dance, Piano, Guitar Lessons or Acting Coaching: $45 per half hour or $75 per hour. Package of 10 pre-paid lessons $40 per half hour or $70 per hour. Showstoppers Broadway Troupe: Membership by audition and invitation only. $320 per month. GROUP CLASSES: At Showtime we believe that the importance of consistent attendance is directly related to the results and progress that each student achieves. We also know that emergencies arise and there may be a time when a student is unable to attend their regularly scheduled class or a class may be cancelled due to an unforeseen event. In the event of a class cancellation, every effort will be made to notify you in a timely manner. The instructor and the school may choose to reschedule the class or allow the student to select a make-up class. No refunds or credits will be given for missed classes. SHOWTIME policy states that the student is entitled to a make-up class in another class that is at their current level. This make-up class must be reserved and arranged through the staff at the front desk and must be used within the month the class was missed or the month following otherwise, the missed class make-up opportunity will expire. PRIVATE LESSONS: Our teachers have reserved private lesson time expressly for each student. Should a student find it necessary to miss a lesson, as a courtesy, please notify Showtime as soon as possible with a minimum of 24 hour notice prior to the scheduled lesson so that a make-up lesson can be arranged for you and for another student in your time slot. Should the student fail to give this advance notice, the student will not be entitled to a make-up lesson. Of course illness and emergencies will be taken into consideration. Should a student miss a scheduled make-up lesson, no replacement make-up lesson will be granted. Make-up lessons will also be arranged should a lesson be cancelled by the teacher or by the school. These make-up lessons will be arranged for a mutually convenient time for both the student and the teacher. No refunds or credits will be given for missed lessons.